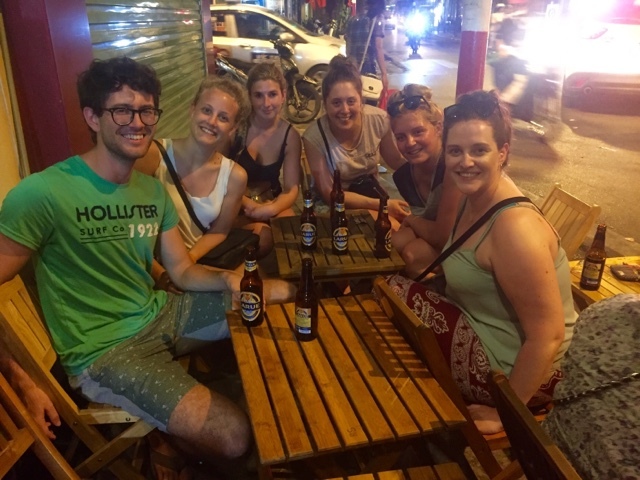 After a snoozy bus journey back to Hanoi Friday afternoon we were dropped off in the old town at our Hostel. As we were keeping things cheap for the last couple of days there was a distinct difference in bedroom quality in comparison to our fancy boat; squeaky bunks and thin mattresses, perfect for what we needed though. We had a quick spruce up and then headed into the town. 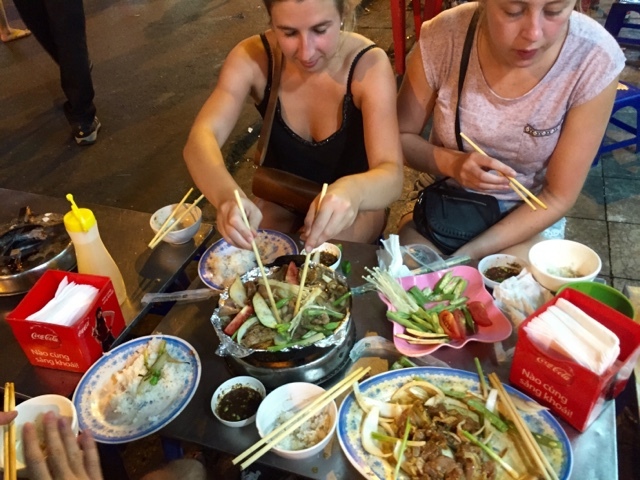 The Canadian girls we had met on the boat had recommended that we head to Mã Mây a street with lots of bars and places to eat where they had met other travellers too. 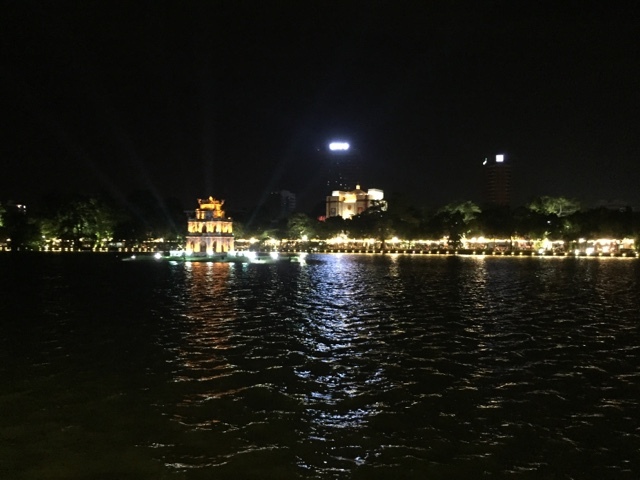 We sat on a street corner for a Hanoi beer and watched the world go by around us; kids rollerblading, women with huge trollies with hair accessories, kids selling wallets and lighters and women trying to sell us deep fried snacks. 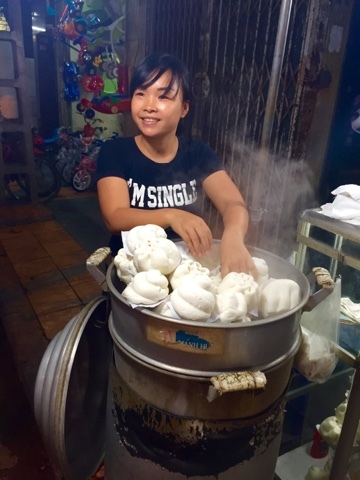 We eventually gave in and tried a variety of doughy snacks, very sweet and a little stale. In the area it seemed to be the thing to have a mini BBQ at the tiny tables and chairs. 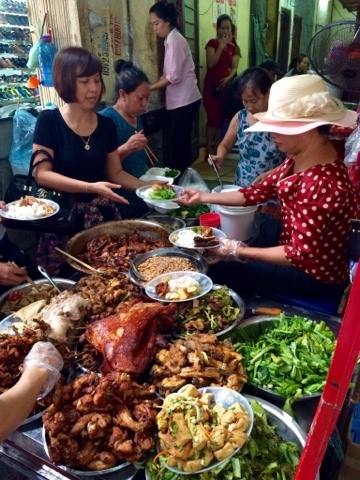 We wandered around for a while looking for the best deal and negotiated a huge plate of meat, veg and rice for just over 100k dong each. We sat down and got cooking with chopsticks on our little stove. 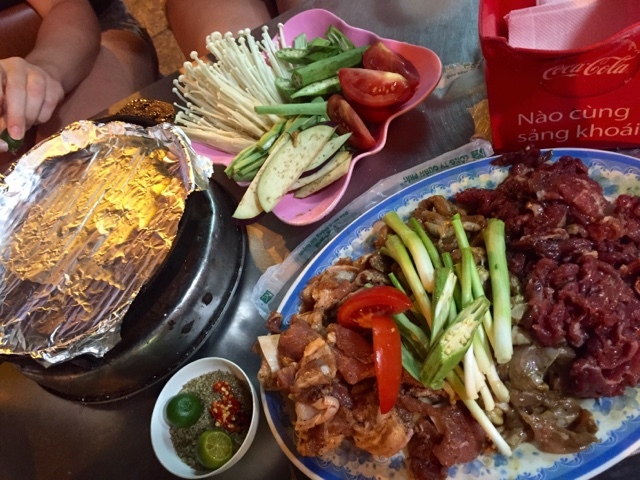 Everywhere we’ve been seems to have a specific food speciality, even different areas of towns/cities and these BBQs only seemed to be in a small part of the old town, as we got nearer to the lake we didn’t see any. A few beers later and we’d found some Brits to chat to in a bar. 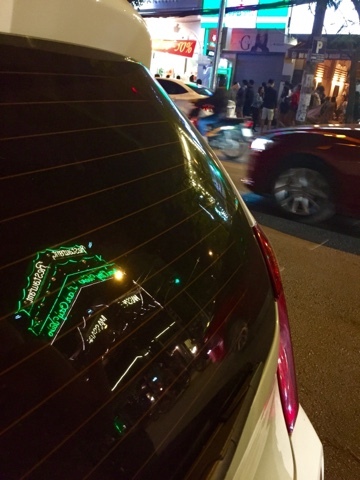 Herry and I headed for a boogie with them whilst the night was young. 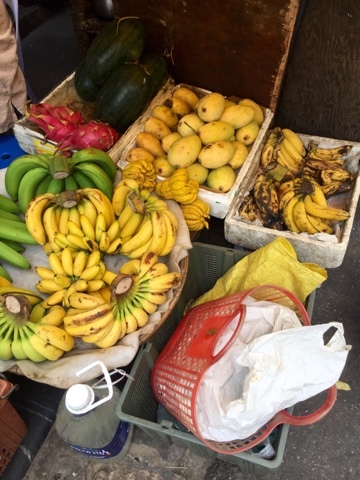 Saturday morning – a little groggy from the night before we headed over to the market which we thought would be small and kitsch but it was HUGE. 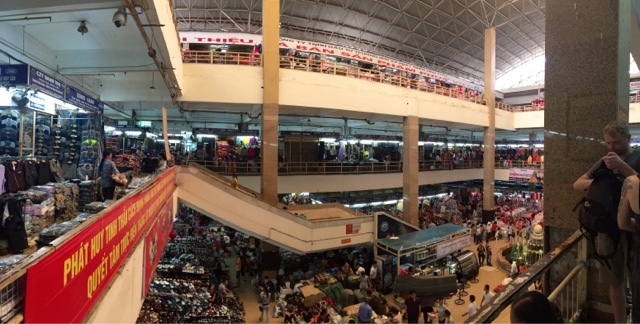 Three floors of wholesale madness – shoes, bags, jewellery, coat hangers, gifts, souvenirs, basically anything you can ever imagine. 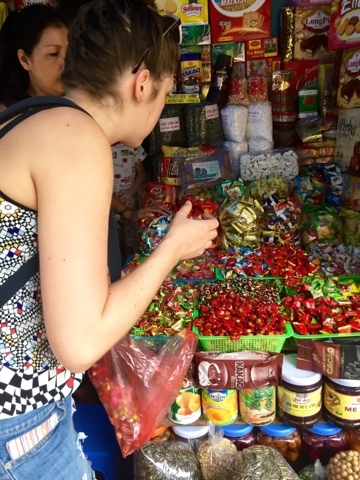 We then wandered the streets finding whole sections of the city dedicated to certain items, sellotape, carpet, sweets, a whole street with mini buffet stalls. 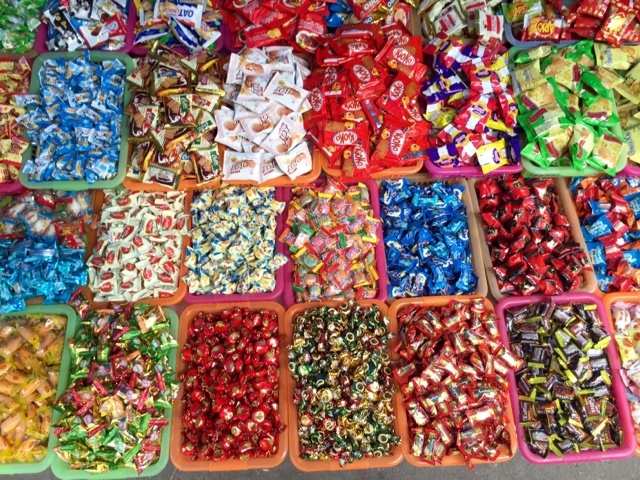 We stocked up on random sweets to share with friends at home, then ended up back on Mã Mây. We stopped off at a spa for some mani-pedis and a massage for Herry. The heavens opened and it started pouring with rain, just like Ho Chi Minh. 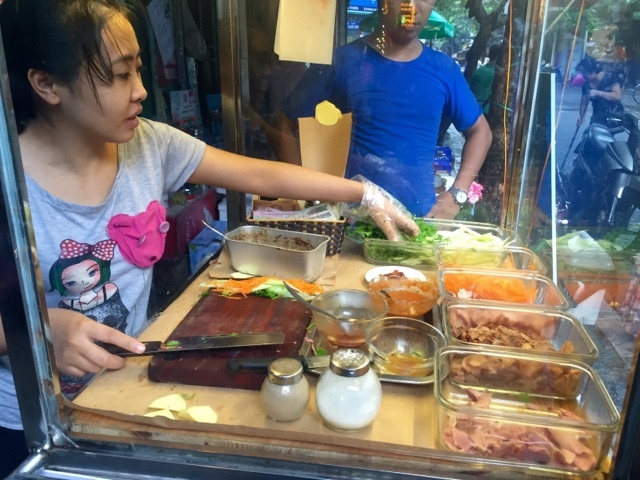 After grabbing our waterproofs we headed to the 2nd best place to eat on Trip Advisor – a small Bánh Mì stall with some chairs and tables in the street. 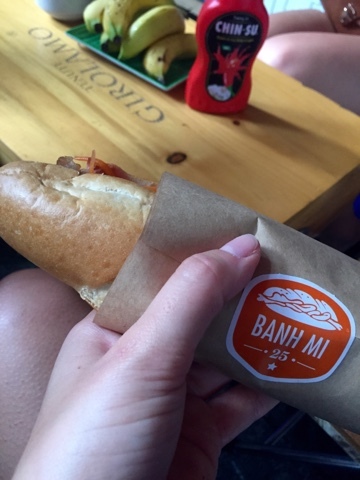 This Vietnamese baguette was introduced by the French in the early 20th century and typically had pâté or ham in. Now, you can get them across the country with different meaty fillings and salad. This one in particular had pâté, ham, pork, sausage, cucumber, carrot, coriander and a little hot sauce – it was so good! The set up of the tables and chairs was cute and whilst we were there loads of people came to get butties, you could tell why it’s so highly rated mmm. 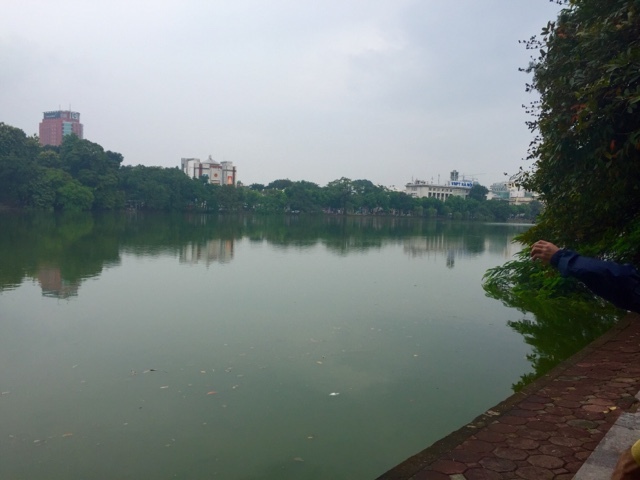 Next stop for the day was the Hổa Lò Prison, we walked across town past the lake to get there; it was pretty despite the miserable weather. The prison was built in the late 1800s by the French colonists to house Vietnamese political prisoners, after 1954 when the French defeated it was handed back to the Vietnamese and during the war was used to house American prisoners of War. Most of the prison was knocked down but the gatehouse still remains and is now a museum. 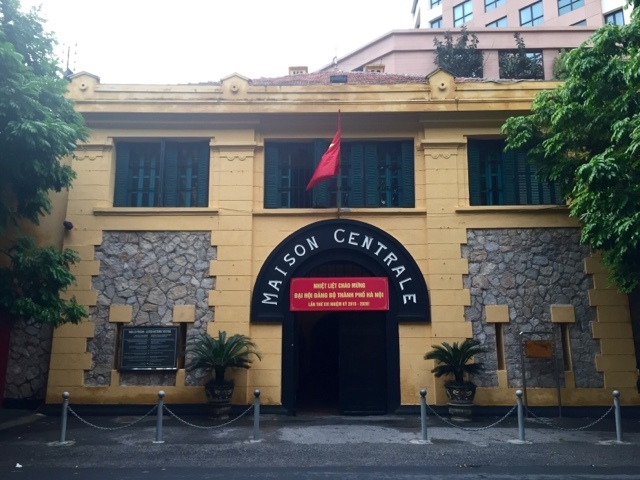 The French named it Central Maison, however it’s commonly been referred to as Hoa Lo prison which is due to the area it is in – before the prison was built there was a small village which specialised in making stoves; Hoa Lo translates roughly to “fiery furnace” or “stove”. 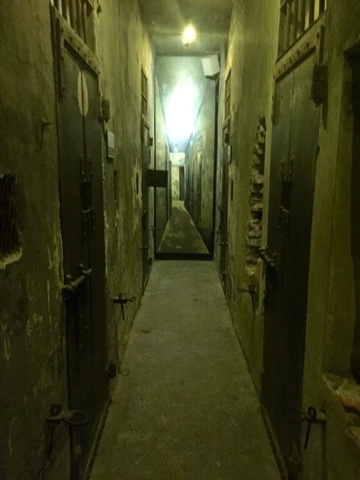 Wandering around, there was information about the way that prisoners were treated there – the prison was built for 600 people but at one point housed 2000 so you can imagine the living conditions were appalling. There was a guillotine, and also a map showing the routes that some prisoners used to escape from the prison. People from the outside often helped prisoners by providing them with tools to escape such as acid and saw for getting through railings, other people would throw over tobacco into the prison whilst prisoners would throw letters in the opposite direction. This was another harrowing example of how people are so poorly treated during wars. The sun set and it was our final evening in Vietnam. 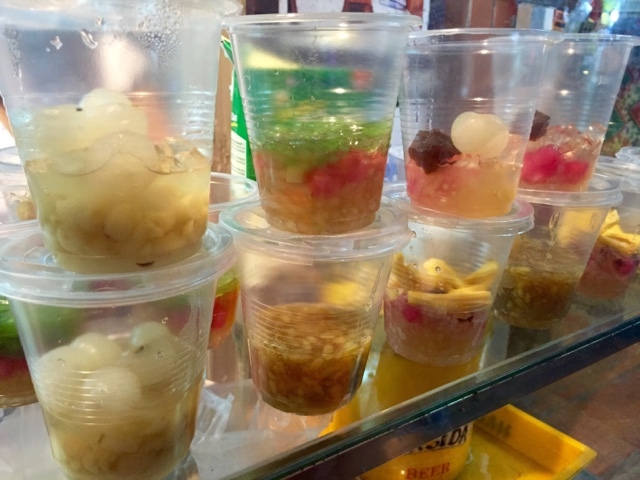 We wandered the streets some more, trying out some street dessert, and negotiating the traffic without getting hit by a moped. 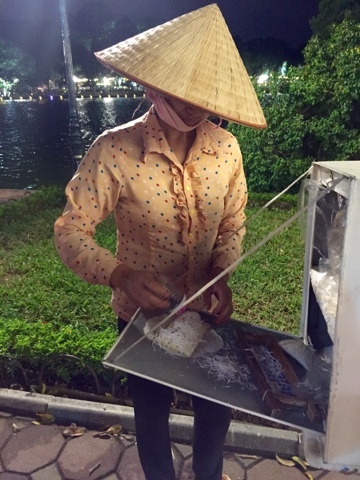 We had some noodles and spring rolls for dinner and headed back towards the lake to see it all lit up. 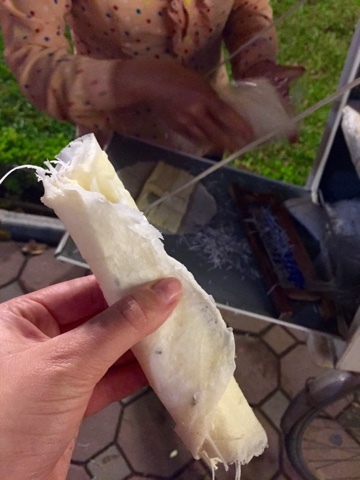 Some more delicious street food we’d not seen before; a pancake with grated coconut and some kind of honeycomb addition. We followed the path all around the lake. It seems to be quite a romantic spot, there were loads of couples and people selling “I love you” balloons alongside teenagers dressed up for Halloween and one girl who wanted selfies with me and Rach – all very random! 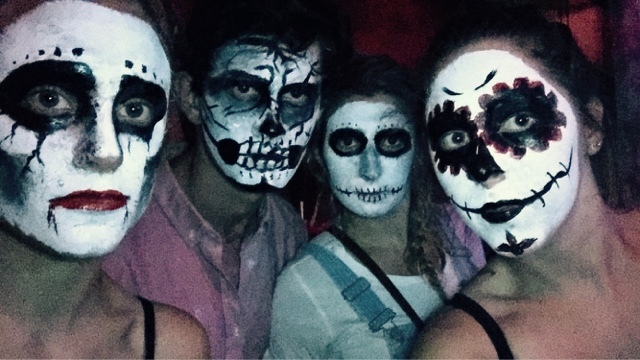 Back to our favourite road for Halloween Face paint at the one of bars and to watch the rugby! Not sure what kind of paint they put on our faces but eventually after limited facial expressions it started to crack and we peeled it off after we saw the All Blacks victory and headed home to our squeaky bunks. 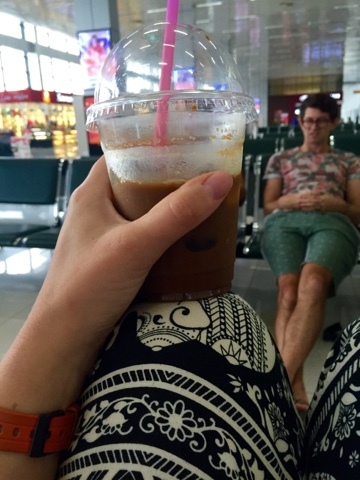 Now we’re one of three flights down, waiting in Ho Chi Minh airport for our flights home and having my final Vietnamese coffee. 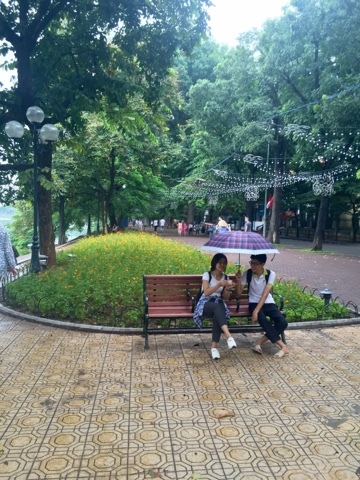 It’s been so much fun, and there’s still so much to do and see here in Vietnam, so I’d definitely come back and recommend the trip to anyone. 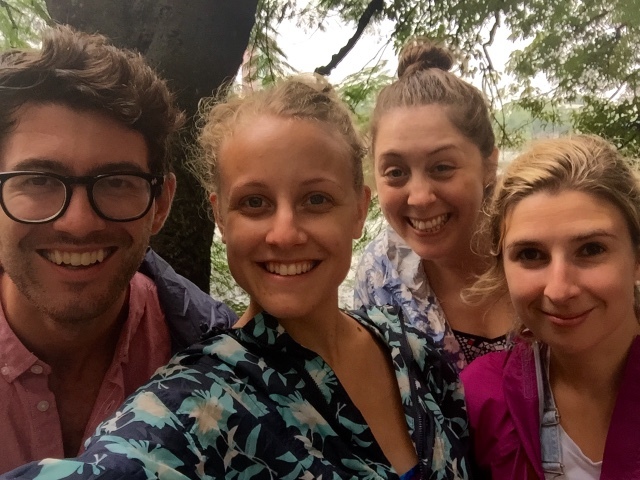 Everyone is friendly, smiley and have great memories, they always remember your names! 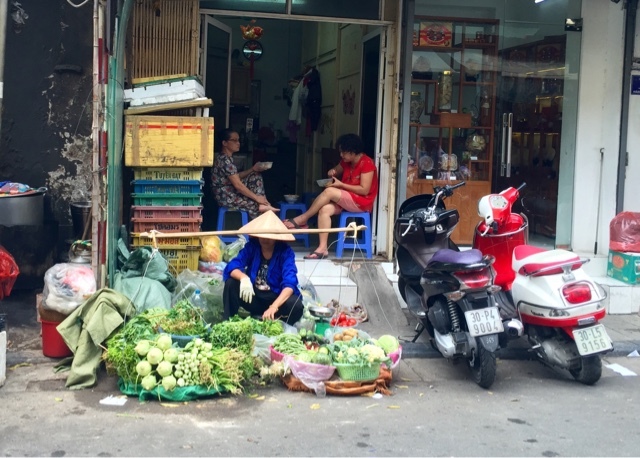 I’ve loved Vietnam so I’ll probably post again with some tips and more photos from my camera, keep an eye out! Next Post What makes your story worthy of sharing?